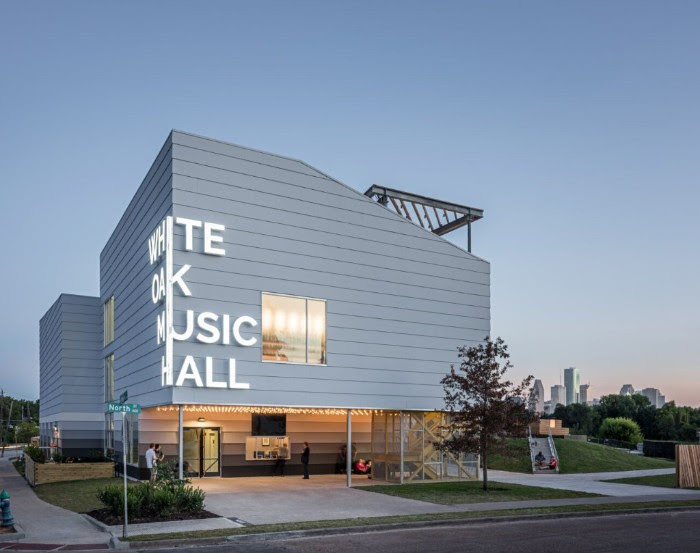 Houston and New York-based architects SCHAUM/SHIEH, have designed a dynamic cluster of music venues in Houston consisting of The White Oak Music Hall, The Lawn, and Raven Tower Pavilion. 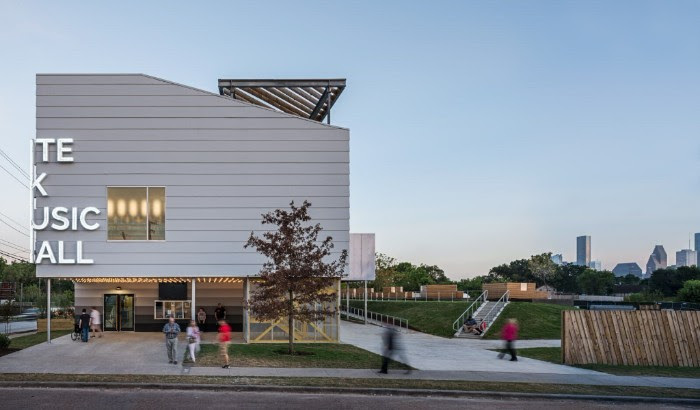 The project is a seven-acre assemblage of new and adapted buildings, open-air structures, landscaped areas, and paved and decked surfaces along the Little White Oak Bayou. 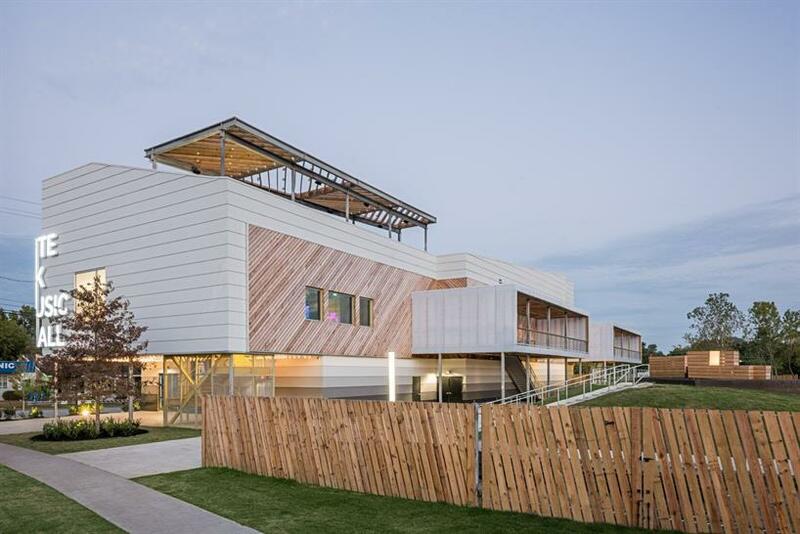 Pieced together from one large main site and a collection of smaller lots, the project is a unique example of urban infill, feathered into the fabric of the neighbourhood on both sides of the bayou floodway and offering views of the Houston skyline. Owned and operated by a diverse and local group of live music fans and professionals, the venues offer a new state-of-the-art, transit-oriented cultural hub for the Near Northside neighbourhood and for the city. White Oak Music Hall (WOMH) is the anchor of the project. Completed in 2017, the building houses two performance halls: WOMH Downstairs and WOMH Upstairs. 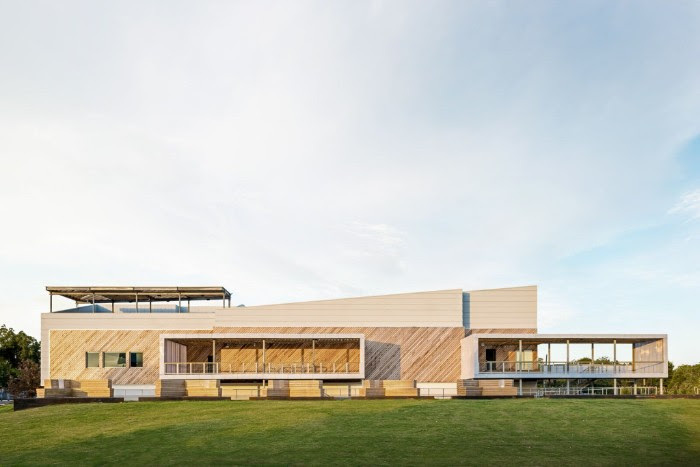 With a 1200-person capacity, WOMH Downstairs is the main hall and the heart of the building, containing two levels lined with cedar slats that are spaced to acoustically tune the room and provide pockets for ambient lighting. WOMH Upstairs' 200-person capacity provides a more intimate setting for up-and-coming acts. Windows behind the stage allow audience members to peek at the skyline while watching a show. Throughout the building, the material palette is matter-of-fact and elemental: steel bar, concrete bar, wood bar. The aesthetic is deliberately direct: the circulation is painted in immersive bright colours that pop in contrast to the dark performance and tech rooms and mark the different zones of the building. Like the industrial buildings that have traditionally housed rock and roll venues, the building is built for vigorous use; the materials selected and detailed to sturdily meet and wear with the rough handling expected. 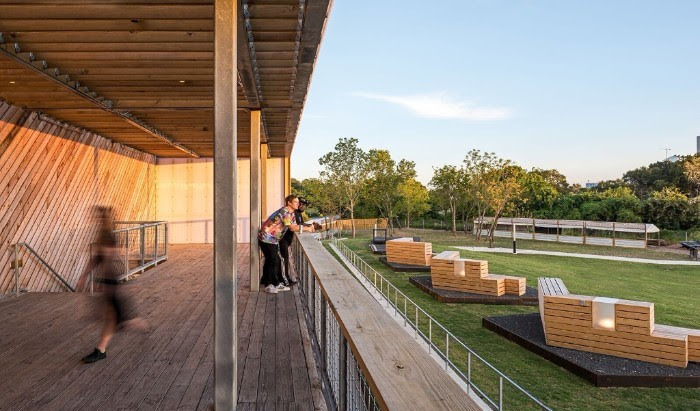 The White Oak Lawn is a 3,800 capacity amphitheatre that was sculpted to frame the landscape around the bayou and the skyline. Prevailing winds keep concertgoers cool even on hot summer nights. Balconies and a roof deck add a vertical orientation to the venue, and support an intimate audience experience. Lastly, an existing metal warehouse and unique landmark steel tower were converted into the Raven Tower Pavilion, slated to re-open as a bar and small performance space in late February / early March 2018. Large arched openings were surgically sliced into the steel building to open it to natural ventilation and views. The existing 20-ton steel crane became the proscenium to a small performance area. A decked patio along the bayou conceals a water detention pond, extending and integrating the performance space back into the laid-back landscape. Beyond contributing to the cultural life of Houston in an exceptional way, this cluster of venues keys into the expanded light rail at Quitman Street as well as the latest extension of the Houston Bayou Hike and Bike trail network. In a city defined by automobiles, White Oak Music Hall builds upon and encourages the use of public transit and bicycles.